Dallas, TX (Restaurant News Release) MOOYAH Burgers, Fries & Shakes, the growing Dallas-based better burger franchise brand strives to provide the very best burger experience year-round but starting November 12, the company is giving Guests a reason to really say, “Dang!” The company is bringing back its annual roundup of the most popular burger builds from its Taste to Try series with the Burger Hall of “Dang!”® promotion. The Indulgent BBQ – half a pound of 100% fresh, never-frozen Certified Angus Beef®, two slices of melted pepper jack cheese, crisp Applewood smoked bacon, golden fried onion strings, BBQ sauce and real mayo – all on a baked in-house bun. The A-Wonderful – half a pound of 100% fresh, never-frozen Certified Angus Beef®, melted American cheese, Applewood smoked bacon, grilled onions and A.1.® sauce on a freshly baked potato bun. The Best Quesonario – quarter pound of 100% fresh, never-frozen Certified Angus Beef® smothered in green chile queso and topped with fresh tomato, fried onion strings, jalapeño slices and a touch of mayo all on a non-GMO potato bun. The Hamburdog – quarter pound of 100% fresh, never-frozen Certified Angus Beef® topped with an all-beef hot dog, cheddar cheese, bacon, jalapeños, fried onion strings, and ketchup. The Well D’Onion – quarter pound of 100% fresh, never-frozen Certified Angus Beef® topped with cheddar cheese, spicy ranch, lettuce, and onions done 3 ways- diced, grilled and fried. MOOYAH Burgers, Fries & Shakes is a fast-casual, “better burger” concept offering mouthwatering made-to-order burgers, French fries hand cut from Idaho potatoes, and real ice cream shakes. Founded in 2007, the Plano, Texas-based company serves fresh, 100% Certified Angus Beef® brand burgers, all natural Jennie-O® turkey burgers, all natural grilled and crispy chicken sandwiches and black bean veggie burgers. 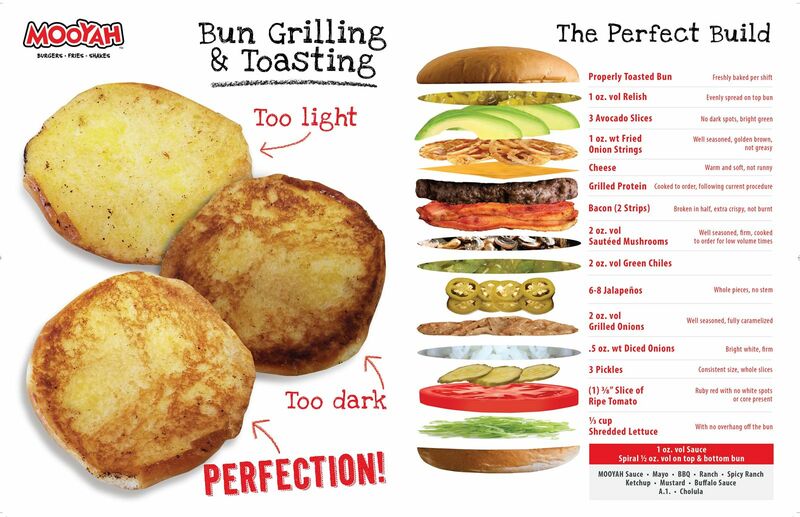 MOOYAH’s non-GMO potato and multigrain buns are baked in-house daily, and Guests can choose from five real cheeses, bacon, avocado, chili, and more than 20 free sauces and toppings made from garden-fresh veggies. While many Guests dine in-restaurant, MOOYAH also offers online ordering and carry out for Guests on the go as well as a loyalty app. In 2017, MOOYAH was named to Entrepreneur’s Franchise 500 list, Franchise Times’ Fast & Serious list of the smartest growing franchise brands, and was ranked #11 on Fast Casual Magazine’s annual Top 100 Movers & Shakers, a list the brand has been included on every year in the last ten years of rankings. For more information on MOOYAH, its menu or franchising opportunities, please visit http://www.mooyah.com. Connect with MOOYAH on Facebook.com/MOOYAH, follow MOOYAH on LinkedIn, Twitter @MOOYAHburgers and Instagram @MOOYAHburgers.